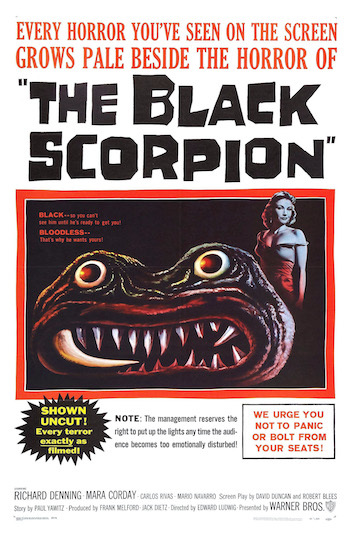 Even though I had never seen The Black Scorpion before, I actually had. You see, the Earth has once again gone and shoved it up our collective bums by coughing up another mutant-sized pest. Luckily for us Americans, it was all happening down south of the border in Mexico where the only people who would get trampled and all stung up by these overgrown creepy crawlies would be those guys who stole all our jobs with NAFTA’s help. 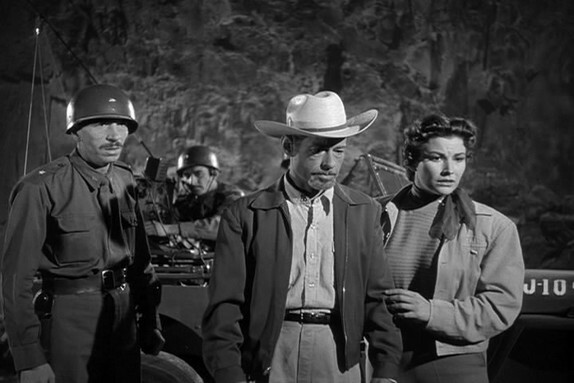 Richard Denning (Target Earth, Day The World Ended) plays Hank Scott (though I’m pretty sure they meant “Hunk”) and he’s only going to let this giant scorpion outbreak moderately interfere with trying to get into rancher Teresa Alverez’s gauchos. Hunk is down in Mexico to check out this big volcano that just blew its top. His local contact is Dr. Ramos. They spend the first part of the movie cruising around the countryside running into lots of mysterious damage. As they make their way to the volcano, they come upon a smashed up police car, an abandoned baby (who Hunk laughingly points his gun at in the movie’s scariest scene), a busted up house, and a dead cop. No time to worry about what’s tearing up the countryside now though because Hunk has his binoculars out and is watching Teresa riding around on her horse. Suddenly, she gets thrown and Hunk goes to her aid, thus giving our hero a love interest to distract him from monster fighting. Hunk and Ramos accompany Teresa back to her estate where they enjoy a nice evening of Hunk expertly putting the moves on Teresa. It involves him saying something about how if they got rid of the scorpion that Ramos found inside a rock and that everyone thought was extinct, that then they’d really be alone. Obviously stirred up by Hunk’s boorish overtures, the scorpions decide that it’s time to start tearing the roof off the joint. They manhandle toy trucks, run through walls, chase people and sting one another to death. They aren’t a terribly disciplined army, but what they lack in organization they make up for in enthusiasm. After the initial attack, Hunk and Ramos get hooked up with the military and a plan of action is devised to combat the scorpions. This is what is known in these kinds of movies as the “halfway plan” primarily because it’s always the plan they cook up at the halfway point of these films. That means that it’s engineered to fail and to result in a few fatalities to build up the monsters as bad guys. The Halfway Plan is sometimes known by its cruder name, the Half-Assed Plan. As far as Half-Assed Plans go, it’s probably charitable to even give it that name. What they’ve decided to do is to try and find where the scorpions hang out during the day when they’re sleeping off last night’s rioting and then gas them. That seems reasonable, so why then am I watching Hunk and Ramos going down into a crevice alone while Hunk is loaded down with a gigantic camera equipped with a big flash bulb? And how in the world did a kid stowaway on their little elevator even though it was the size of a card table and held Hunk, Ramos, a cage of canaries, and cannisters of gas? The kid gets off the elevator and starts wandering around the cave and gets chased by a giant spider! I don’t know for sure, but I’ll bet that there was a split second where Hunk tried to gauge whether the kid could last out there with the spider long enough so that he could get an action shot (can you say “Pulitzer”? ), but with Ramos ready to tattle if it didn’t work out, he wisely decided to start shooting the spider with the gun instead of his Kodak. Of course, this means that the business of gassing the scorpions is out (Hunk lamely explains that they lost the gas down there once he gets up to the surface), so they just decide to blow up the crevice, burying all those freaks below tons of rock. Plus it’ll make a great photo op. It isn’t long before Hunk and Ramos are summoned to Mexico City where they are informed that their plan only succeeded in forcing the scorpions to leave their underground hideout via their back door which just happens to be located nearby. Hunk knows that it’s about time for a final showdown and once the biggest scorpion of them all has killed all the others, the championship bout is set for the stadium in downtown Mexico City! 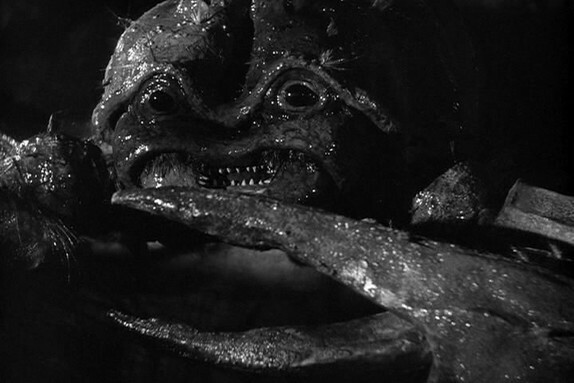 Willis O’Brien (King Kong) provided the special effects on this one and the results are somewhat hit and miss with some interesting scenes (where the stop motion scorpions only interact with other stop motion creations) and some downright awful stuff (close-ups of the drooling face of the scorpion, anytime a scorpion is projected onto scenes with real people in them). In its favor, this movie moves at a decent enough clip and you do get a lot scorpion action, but the use of the hero in this movie is pretty strained and he comes off as being totally ancillary to things. He is a geologist, so he doesn’t have anything to offer on the scorpion problem that you or I couldn’t contribute. How is his ability to identify shale from sandstone going to stop these beasts? 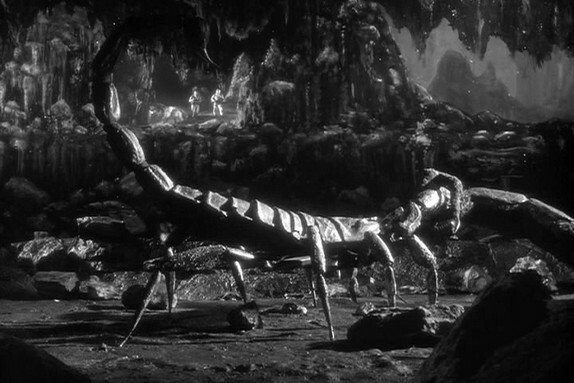 Ultimately, your enjoyment of all this will be dictated by how much your desire to see big bugs beating up foreigners outweighs your aversion to dated special effects, gaping plot holes, an unconvincing romantic subplot, and that bratty little kid pointlessly sticking his nose in everything.